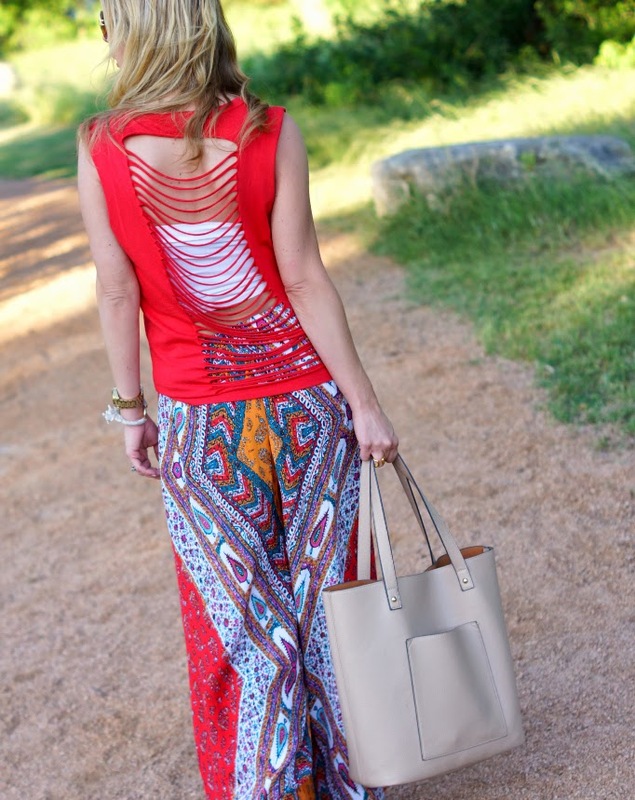 Okay, here we go again with wide leg printed pants. I posted about another pair that I fell in love with here and I am back with round two. I possibly love these scarf printed wonders just as much, if not more. The only thing I wish I'd done before clicking "checkout" was go down a size. I bought the medium instead of the small. Because of the elastic waist, I could have gone a size smaller, but I was so excited to wear them, I ripped off the tag before realizing they were a tad bit too big. So, if you are interested and grabbing a pair for yourself, consider sizing down. 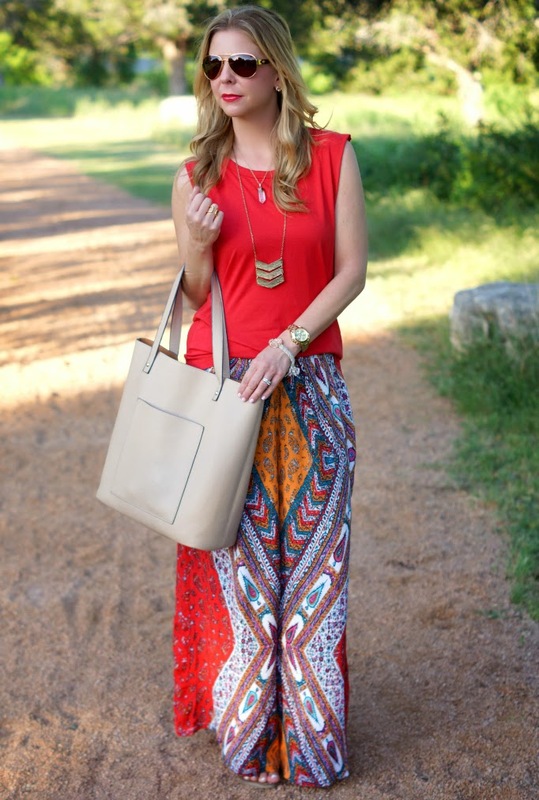 Wide leg pants are a fun alternative for maxi dresses and skirts. I found both pairs at Forever 21 for under $30. The material is lightweight and breezy. I wore them to our annual outdoor crawfish boil on Saturday. The temps were warm and hit close to 90 degrees. I never felt confined, uncomfortably hot or wishing I would have grabbed a pair of shorts instead. Just like the last pair I posted, they are not see-through and airy enough for warm sunny days. As much as I am drawn to dresses, skirts and shorts when the weather heats up, I do believe I have discovered a new option that is equally stylish, cool and substitute for my norm. Thank you, wide leg, flowy, elastic waist pants for making a strong fashion comeback. Please, please hang around for awhile. P.S. 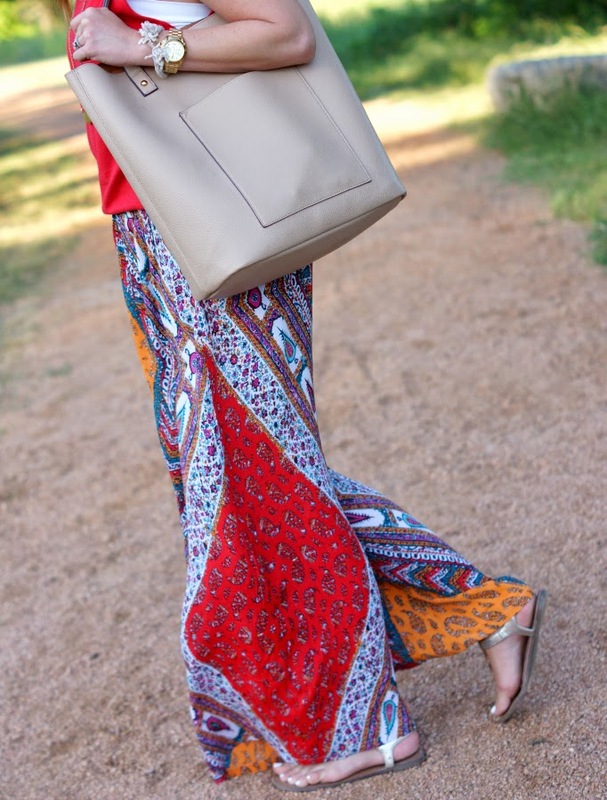 If you are interested in seeing more options for wide leg, printed pants, make sure to check out this post. I shared a few favorite finds that I think will catch your eye as well. P.P.S. Dear Lord, I just realized that I am walking, talking Forever 21 addict in this post. I may need intervention. I think I love these wide leg pants just as much as the other ones. They look great on you! You are making it very tempting to buy a pair since I have some store credit. Those pants look great on you! Love the neutral tote... so simple and chic. Have a wonderful day! Love the top! And those pants are so cute - I love how bold they are! These pants are so comfy and so perfect for Spring/Summer, I'm currently trying to avoid Forever 21 lol. The pants are so much fun....and I am loving the back of this outfit! I keep trying these types of pants on but not sure they work for me - love them on you, though, and the back detail on that tank is too cool! Love the pants..but even more I love how you styled the whole outfit! Perfection! I think this pair is my favorite I have seen on the interwebz!!! Girl, you look amazing! I really want to try wide leg pants, but I'm so afraid they'll make me look stumpy. i have been obsessing over these print pants lately. i just need to make the buy already! These pants look so comfy and I love the back of that top! Can't believe how hot it is over there already...you guys went straight to summer! 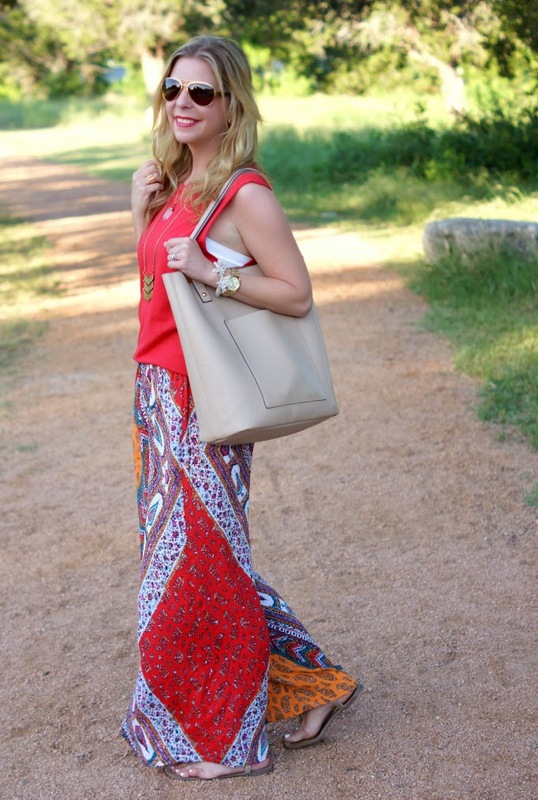 I am officially obsessed with wide leg pants because of you! I need a pair in my life like NOW. You look fabulous as always darling! Okay, I need these pants, like now. Don't be surprised if you see them on me sometime soon!! Honestly if I found as many cute things as you did at F21 I would be an addict, too! Those pants are so cute! These look so comfy! I love the fun, bright print! Love them. I am a forever 21 addict as well. It's hard to not be a F21 addict! Everything is so fun and pretty! I especially love this tote, I honestly couldn't believe it was from there! Great outfit!!!!! Love it. Perfect for Spring!!!! i pretty much only shop at forever 21, it's just the best! and i need to try on these pants, stat! I bought my first pair of pants like this this weekend! Since we can't wear shorts to school, I needed something that was cool enough in this heat!!! 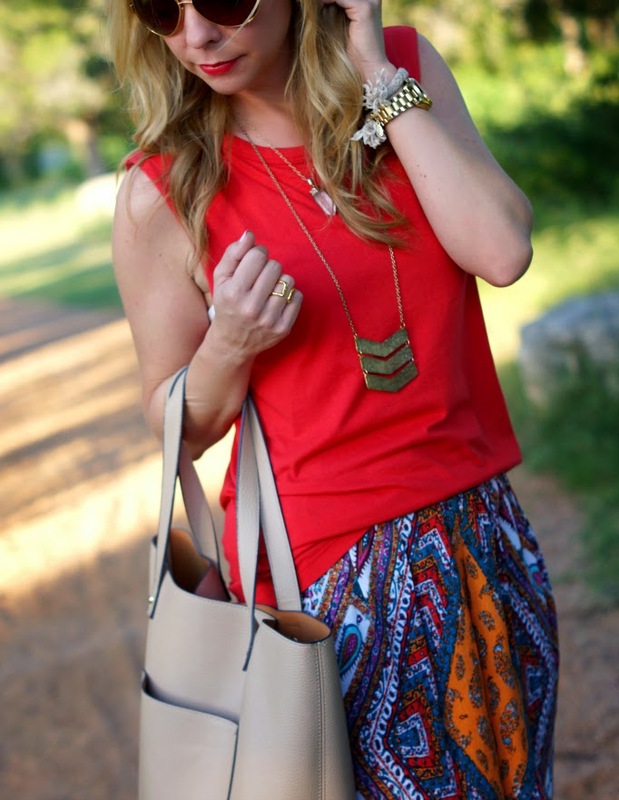 These pants seem perfect for warm weather! Light and airy but still covered for when it is slightly chilly out. great styling here, Shanna! These pants look so good on you! Love it! These pants look so fab on you. I love the top that you paired them with too! Those pants are absolutely fabulous! I love the print! SO cute! I have several jumpsuits with wide legs and one pair of linen wide leg pants but I need a pair of breezy pants like this! LOVE the print. These pants are gorgeous and I may need to break down and buy them and be your TWIN;) I love that you rip tags off in excitement, I do the same thing! I freaking LOVE these pants! The print is great and I love the back of the top too! Love the colors in that outfit and the back of the shirt! So pretty! (too short), but you look great! Forever21 has some great finds lately it seems like from all your recent outfits! Those pants are so fun!! You definitely pull them off so well. Love the print! Love your pants and your necklace! Love love love this outfit! So cute... as always. Oh goodness these are positively beautiful! Festive pants for a festive party! And that top has some sass to it!! I am all about skirts and dressed, however I have recently really been liking all of the "look really cute but are actually like PJs" pants. Love the print and the colors of these! Gorgeous! Love those pants, they look so stylish yet super comfy! Love the pants...the colors are fabulous and they look so comfy. Fortunately because of the style you can't tell they're too big. They look great! You seriously find the most amazing pieces at F21! I adore these wide legged pants so much! This may be my favorite outfit! Until you blow me away with another look! Always gorgeous Shanna!